Our Chicken Cheese Puffs are ideal for snacks or appetizer menus anywhere! The filling is well seasoned chicken with a sweet & tangy BBQ sauce. 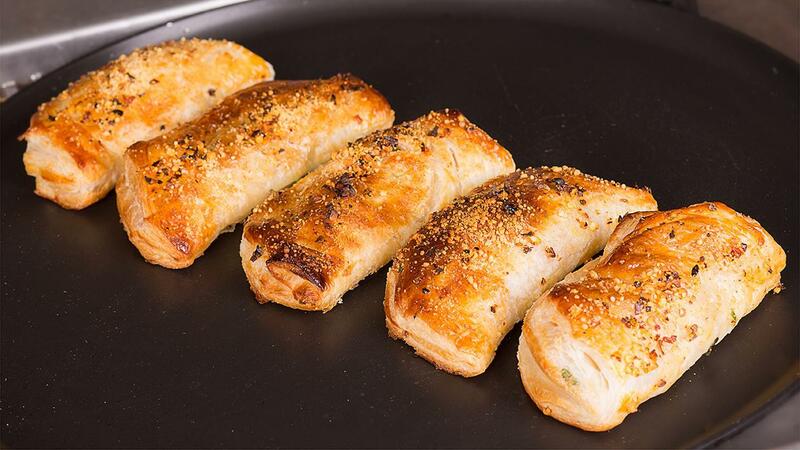 The puff pastry is baked golden with oregano and parmesan cheese on top. Download the recipe below! Marinade the chicken pieces with Rafhan Corn Oil, Knorr Chicken Stock Powder, chillis, Knorr Lime Seasoning and white pepper for 1-3 hours. Grill in a pan until brown then add in all the sauces. Glaze the chicken with sauces and remove from heat. Once cooled down to room temp. add in the grated cheese. Put the filling on one side of pastry and apply egg wash on sides to seal the edges and fold it into D shape. Apply egg wash on top sprinkle parmesan and oregano and bake in a moderate oven on 180°C for 25 mins till puffed and golden. Serve hot with Knorr Tomato Ketchup.